A mural is a large picture that has been painted directly onto on the wall of a room or building. This post shows Josh Agle’s work that has been executed oversized onto walls via the medium of paint or outsized digital printing. A custom vinyl mural produced on a large-format commercial screen printer adorns the wall of this family arcade room in Tustin, Orange County, California. The room was re-modelled in December 2013 and features a sepia-toned copy of Shag’s 2014 print The Original Owner. American actor and musician Drake Bell has a mural of Shag’s 2010 print Two Hours Past Bedtime on his staircase and living room wall. The Shag Store in Melrose Avenue, West Hollywood, Los Angeles had an excellent mural before opening (based on the 2015 print The Dusty Walk and a second even better one after opening (at the entrance). 2015 print The Refill has been converted (with a little artist’s license) into a mural for the games room at the Rockefeller home in Palm Springs. In 2005 Shag was commission by Georgia Aquarium to a huge mural showing life undersea. 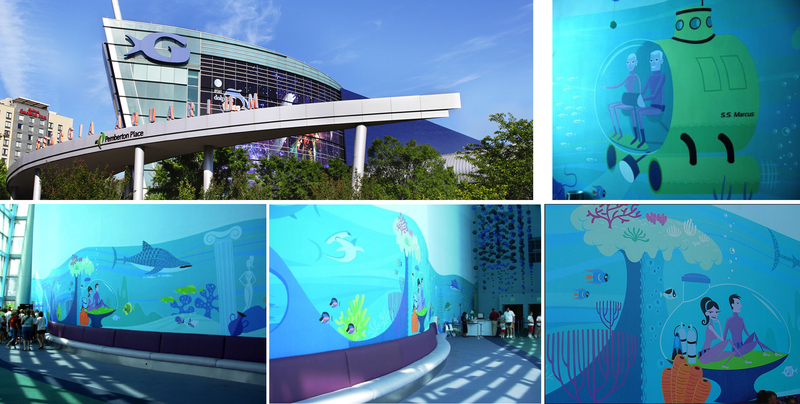 The painting is over one hundred feet long and twenty feet tall and featured at the aquarium opening in November 2005. And to end with some modern Tiki style which suffered an unhappy end due to a lack of conviction by Venetian management. Shag provided the artwork and theme for the Venus Lounge at the Venetian, the bar opened in 2001 and closed in 2004. The mural was located between the Venus Lounge and Bosko decorated Taboo Cove. The Shag menus, swizzle stick, napkins and were all popular with guests – a little too popular by the number of post-visit eBay listings.